Greetings from the clouds…yes I do look like an alien. 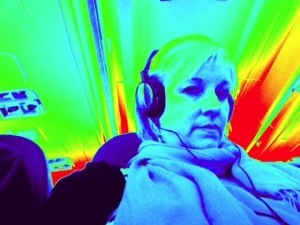 This is me with 3 hrs and my iPad with no netflix at 30000 feet. I’m so sleepy! And crammed in this seat! Can’t I just lay down in the aisle for awhile? You look positively radiant…lol …hope you took advantage of a snooze before landing! Laying in the isle might have netted a pick-up on landing…by people you didn’t know.